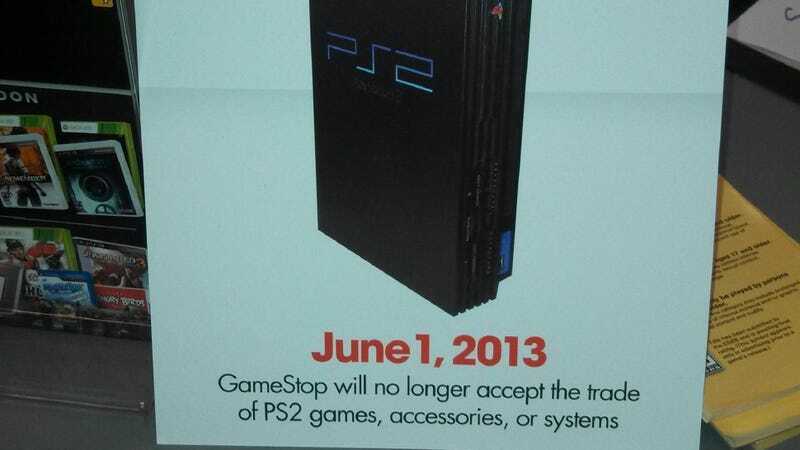 According to this poster, beginning June 1, GameStop will no longer accept any PlayStation 2, nor any PS2 game, nor its accessories. We've reached out to GameStop for official confirmation, but this does not seem so farfetched. I traded in a Slim about three weeks ago and got about $12 for it in store credit, and considered myself lucky. Thank God I still had the video cable. Some PS2 titles have destroy orders placed on them—meaning that they have no trade-in value, and if a customer leaves the disc, to just throw it in the trash. And, of course, the PlayStation 4 is expected to get a close-up at E3 in early June. GameStop's refusal to accept a platform or its games and accessories for trade-in is typically the final Kübler-Ross stage in console grief. The PlayStation 2 ended worldwide production at the beginning of the year, following a 13-year run in which it was the undisputed best-selling video game console of all time, selling more than 150 million units and 1.5 billion copies of games. Hic iacet PlayStation. Rex quondam, rexque futurus.